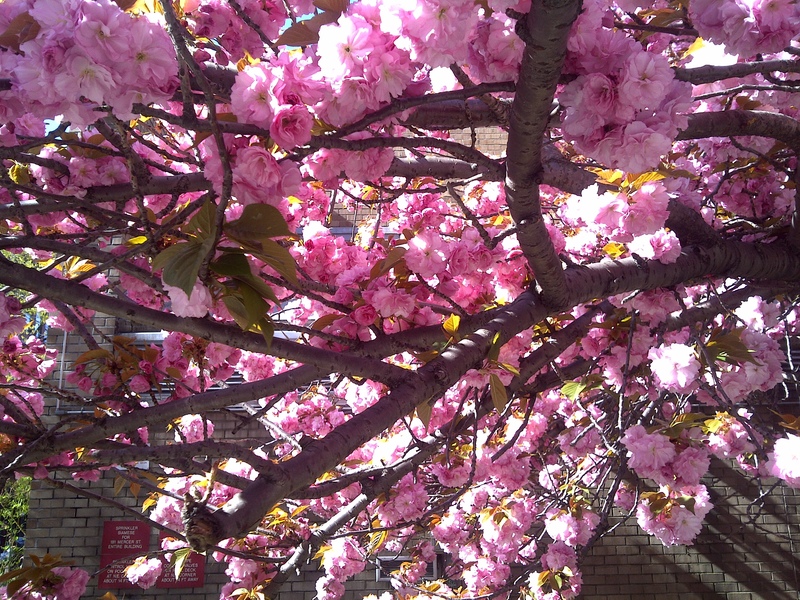 cherry blossom and cafes full of intellectuals reading Barthes and Heidegger – a springtime saturday tale in NYC – teamgloria, inc.
Posted on April 7, 2012 April 7, 2012 by teamgloria in places. The cherry blossom is so lush and full that it hangs ponderously over manhattan today, at every street corner urban garden and runs wildly through central park. So it was thus enveloped in fragrant flora that we tripped lightly to therapy (an American Cliche but actually So Helpful – now one tells the truth, or our nearest relationship to something akin to Real feelings, darlings). And now – post-therapy – we are surrounded by piles of just-read-european-newspapers and mostly male intellectuals with slight shadow and furrowed brow reading roland Barthes and Heidegger. Before we moved to NY, we had a sojourn in Los Angeles (as you may have read in these pages before – ) and before that, spent a decade in London, during which time we did a Lot of research about Life in Manhattan through books and newspapers and films…………..and so we have no Idea whether we just happened to bring forth the Manhattan of our fevered imagination Or whether it really is as we dreamed . Barista ‘dudes’ in artful italian denim and oh-so-casual-Converse. Bright sunshine that requires shades at All Times. Used bookstores and students in vintage tweed. Hedge funds are elsewhere. We don’t mix That Far downtown, darlings. Our ‘beat’ (as they used to say in news-worthy-newsrooms) is here – the bit between Indochine and Gemma (bowery), Mercer (for noodles at Kelley Ping), newsagent-of-international-repute full of Italian fashion models (chaps) and blonde brits (writers of novels) on sullivan. And then there’s that bit in the sniper fire of midtown where we earn the cash to travel and live and meet Very Interesting People. But down here, on a saturday morning, after revelations in therapy and before taking-a-train to brooklyn for brunch – this is perfectly manhattan. From 1986 or 72 or 91. But this is Exactly how we thought it would be. Negotiating femininity; the thrill of participation in the swimming pool akin to the feeling part-of in london clubs back in the day; Corporate power structures and family of origin work. – exactly what you’d expect, in Manhattan. We just didn’t know about the cherry blossom. That has been the most delicious surprise. I love it when people use words in a more random manner than your standard Sesame Street level. I can tell you are a writer in a good way…With your words, I can feel the atmosphere of the NY you describe and still it is not too concrete, more flowy, and like poetry some sections make a lot of sense and others are more fleeting to me. that was lovely. Manhattan is always more and a little bit less than what we dream of it.